When a Football Manager simulation made eerily accurate World Cup predictions, fans started wondering: can it help you beat the bookmakers at their own game? The 2018 World Cup threw a few curveballs. An early German exit, England winning a penalty shoot-out and Croatia reaching the final all categorised a gloriously bizarre tournament. But one thing nobody predicted was quite how predictable it all was – at least for Football Manager fanatics. Take YouTuber GoldenFM. In March, he created a simulation from the in-game editor using the exact group tables and fixtures to see what we might expect from the tournament in Russia, making the database freely available to download. After testing his simulation 100 times he asked his 45,000 YouTube followers to do the same. After reaching 1,000 simulations, he found some interesting results; France were predicted the winner, England forth, and Harry Kane would win the golden boot. “I’m interested in testing the ‘what ifs’ of the game, and I don’t take it too seriously,” says Golden FM host Paul. “It’s a game, and I’m just messing with the mechanics of it.” Football Manager is the most comprehensive football skill game on the market. Every year, millions of statistics from more than 600,000 global players are compiled by a team of over 1,300 researchers for developer Sports Interactive. What for Paul was a fun experiment has, perhaps inevitably, become a subject of frenzied fascination for some. The big question: can you make money from Football Manager? One of those testing Paul’s simulation was Dave Matteo, a blogger and major of applied statistics at Swinburne University of Technology in Melbourne, Australia. As a student with not a lot of spare cash to burn, Matteo placed $5 on every group stage team the simulation predicted would win. To do this, he ran the simulation over 200 times, collecting the data and blogging his results, taking over 40 hours in total. In the group stages his overall profit margin was 9.32 per cent but he says that if he adopted what he calls “better betting algorithms” and common sense tactics, his takings could be higher. Once again, Matteo’s simulation predicted France would win the World Cup and Harry Kane the golden boot; interestingly, in his sim, Kane scored most of his goals against Panama, just like in real life. Matteo claims his experiment was far too time-consuming to be exceptionally lucrative, but user Roy Rover is more confident of success. “Setting up the game to match the current real world situation and simulating the match a number of times will definitely give you a better possible outcome than any other betting software,” he says. Rover isn’t a seasoned gambler and only bets on odd games, thankfully, because sometimes Football Manager throws up some ridiculous results. In one simulation, even Iceland managed to win the World Cup. But while checking a club’s data and crunching the numbers through Football Manager could help, it could create other problems. If you’re betting dozens of times per weekend, and Football Manager is influencing your tactics, this may lull you into an illusion of control, a belief that the odds are in your favour as you’re making some of the decisions. “I would say this person is probably a gambler who’s going to lose in the long run,” says Philip Newall, postdoctoral researcher at the University of Warwick. 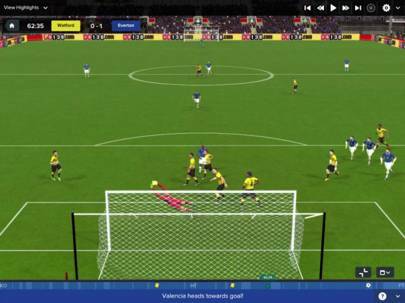 “Football Manager is a good tool in the estimation of game outcomes, but this doesn’t mean it’s useful for gambling or investment,” says University of Glasgow PhD researcher Arman Hassanniakalager. “Major financial companies are doing sports betting through very advanced methods and I don’t think Football Manager would be able to reach those predictions.” A spokesperson for developer Sports Interactive said the company was aware the game could be used in this way but that it would “strongly advise nobody do that”. In recent years home gaming and gambling have become more intertwined. A 2017 report by the Gambling Commission found that 12 per cent of of 11 to 16-year-olds had gambled in the past week, citing video games and free to play mobile apps as influences. Virtual betting is not something Sports Interactive has ever considered implementing. A spokesperson for the company explains that as the game is a simulation of real life, it would be weird for a “real manager” to come across a loot box, so it would be equally weird for that to happen in-game. But Football Managercan still contribute to what Newell calls the “gamblification” of football. Mathematical edge or not, rarely does a gambler come out on top, even if they win. From Matteo’s 9.32 per cent profit, bookies will still take around a two to three per cent cut. And if you found yourself on a steady winning streak over time, it probably won’t last long. In 2017, researchers conducted an experiment to try and beat the bookies. The system they devised worked – but too well. They were found out and their accounts were either restricted or banned.